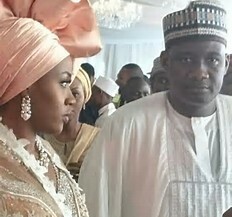 Gen. Ibrahim Badamosi Babangida (rtd) gave out his last daughter, Halimat, in marriage to Gombe state businessman, Alhaji Auwal Lawal Abdullahi, in a high society traditional wedding held at the Hilltop Villa of the former military president in Minna, the Niger State capital. The 3-day event drew attention for many reasons. While many focused on the number of private jets, hired or owned, that landed on the Minna airport tamarc just for the wedding, many others were more interested in the politics of people from different political camps sitting together on a table and even exchanging banters. According to an exclusive report by Abuja Reporters, here are three lessons that was deducted from the wedding. 1. It was the first time in a wedding of that magnitude that bottled drinks were not served. Neither Coca cola nor Pepsi or other soft drink products were served during the event. The development left many wondering why would a wedding of that calibre not have drinks like Sprite, Fanta, Coke, Pepsi or even Malt drinks. It was gathered that the financiers set out to put forward a message that there are many more local drinks that are beneficial to the body than coca cola or Pepsi products or even the malt products. Guests were served with chilled zobo, various forms of Kunu, there were also straight juice drinks, like pineapple, ginger, and some mixed together in cocktails. For those who liked to experiment with new things, they must have been overwhelmed by the number of drinks that were seemed in gourds. 2. It didn’t end there, the drinks were complemented with food and snacks. At the cultural night, which ordinarily should have featured dancing and singing for the bride, about eight states spread across Nigeria were chosen to present food and drinks which they served to people. Both the people who had invitation cards and those who didn’t, had access to these meals as there was more than enough to go round. Indeed, at a point, people from some of the states were begging to have guests taste what they had. Local snacks especially from Niger State was the order of the day. In normal climes, you would enter a wedding reception and see cup cakes or piece of cake neatly packaged for guests. This was not so. The fine packages contained Donkuwa, kulikuli, kokoro and Gurundi all Nupe delicacies. Maryam Babangida, the matriarch of the family was champion of women empowerment. The whole idea of encouraging local meals and drinks was to bring back what she lived for. Most of the local snacks and drinks were products from women. If we all patronise our local meals and drinks, more women would be empowered and we would also be more healthy. 3. Another takeaway from the wedding was the fact that one way or the other, four of Africa’s richest somehow see IBB as their mentors and were there. Governments come and go, but there is no doubt that the IBB era helped in moulding some entrepreneurs who are today billionaires. They were not contractors but people who saw opportunities in the Nigerian economy and seized them. Mike Adenuga, Folorunso Alakija and Aliko Dangote are a few of these men. They were not contractors. They were entrepreneurs who helped in opening up the economy.